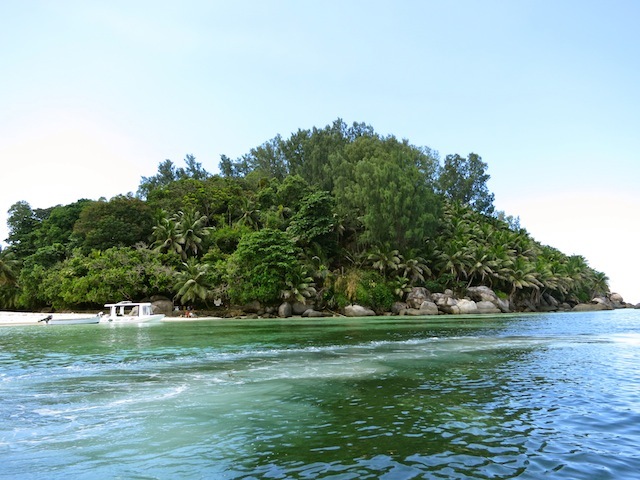 When it comes to visiting Seychelles islands, little Moyenne Island in Ste. Anne Marine Park is where giant tortoises roam – perfect for an excursion from the main tourist island of Mahé. 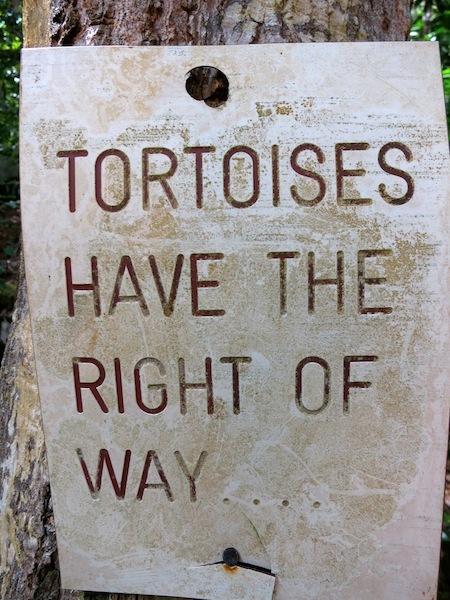 Just remember, tortoises have the right of way! Why snorkel when you can play Robinson Crusoe? “Nope.” Why would I? I’d found something better than fish. I’d fallen in love with a tiny Robinson Crusoe island called Moyenne. 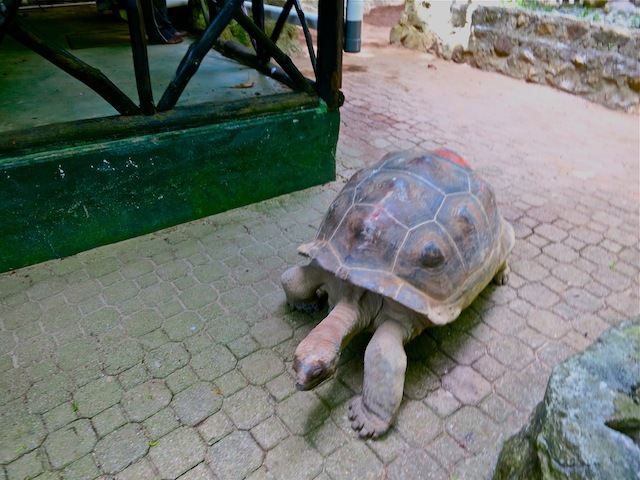 Just half a mile wide, located north of the main Seychelles island of Mahé, Moyenne Island is small and round, covered in mahogany trees, palms, granite boulders and roots – and overrun by giant tortoises. 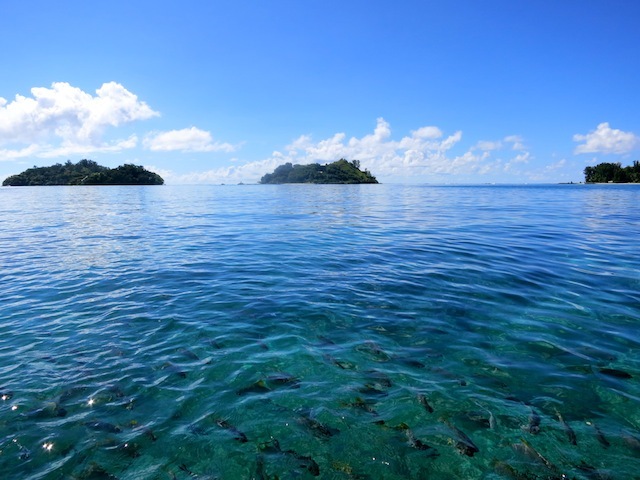 Need more general Seychelles Information? Read Where Exactly are the Seychelles and 10 Essential Seychelles facts you need to know. Moyenne Island is like something out of Jurassic Turtle World and I refused to leave. “Okay, we’ll pick you up in an hour,” Tina said. Don’t hurry, I was thinking. Of all the Seychelles islands I’d seen, there was something about this deserted islet that made me want to stay. Let those other water happy people go off to look at the gorgeous reef and swim with the zebra fishes in the bathtub-temperature Indian Ocean. I had some giant tortoises to commune with. Even if it proved to be more of an adventure than I’d bargained for. Authorities take note: If I ever break the law and go to jail, please put me up at the Shangri-La Long Island. I promise I’ll reform immediately as long as you don’t ever make me leave. I’m not the only person who refused to leave Moyenne Island. An adventurous British man and former journalist, Brendon Grimshaw, bought the Seychelles island of Moyenne in 1962 for 8,000 pounds. That’s like $16,000! A steal! Eventually Moyenne Island was worth millions, but Grimshaw refused to sell, though I heard a Saudi Prince once offered him a blank check. 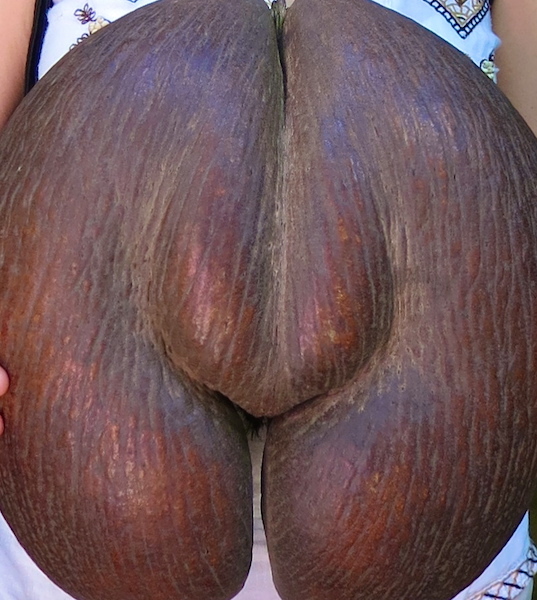 The amount of 34 million euros was kicked around, but personally, I wouldn’t settle for less than 34 million, two giant tortoises and a coco de mer, a large nut unique to Seychelles islands and shaped like a, er, women’s, um, lower pelvic area. 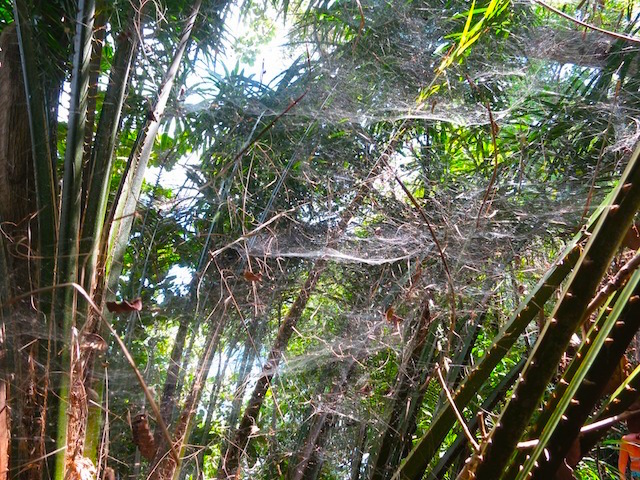 Trees and cobwebs! You saw it here first. 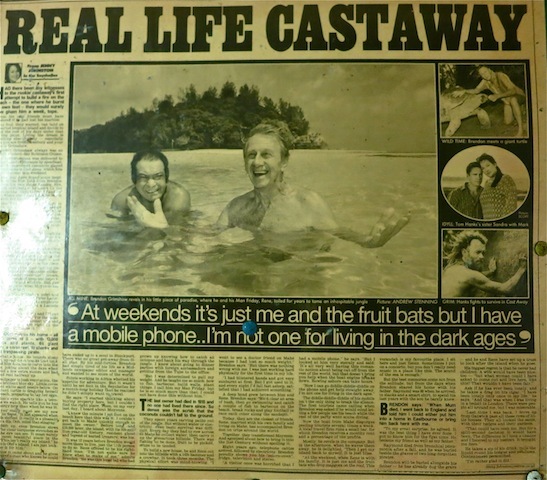 A year after Grimshaw’s death, STB, the Seychelles Tourist Board, declared Moyenne Island a national park. Now that’s a tourism ministry with foresight. The Tourism Minister for the Seychelles is Mr. Alain St. Ange and he’s doing so much to promote this stunning outpost in the Indian Ocean so kudos to him and his vision for the future tourism of the islands of Seychelles. But you have to hear more about Moyenne! It’s crazy and will steal your heart. 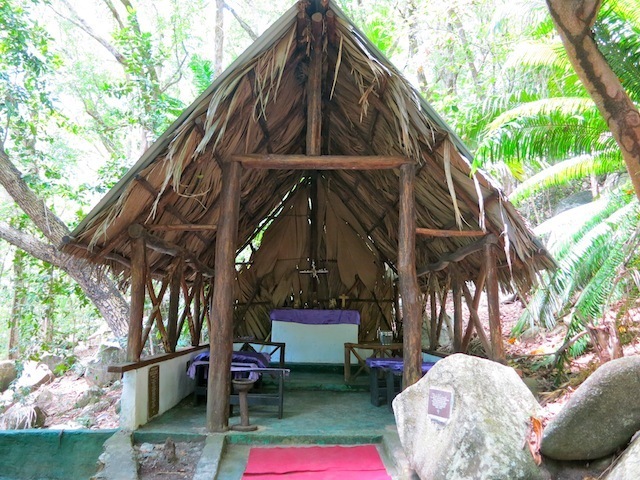 Brendon Grimshaw loved Moyenne so much that over the years, he cleared enough scrub from this wild nearly impenetrable Seychelles island to build trails, a small home and an open air chapel. 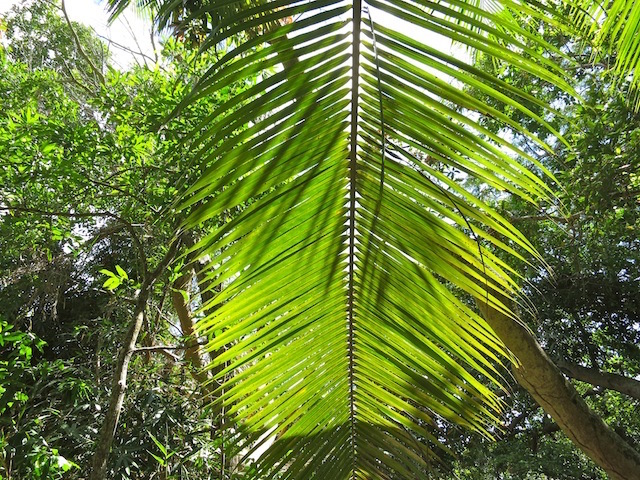 Along with his trusty pal, a local Seychellois named Rene Lafortune, they planted some 16,000 trees including palms, paw paw, mango trees and other local plants, and encouraged birds to come – because the island was so uninhabitable when Grimshaw bought it even the birds wouldn’t touch it. 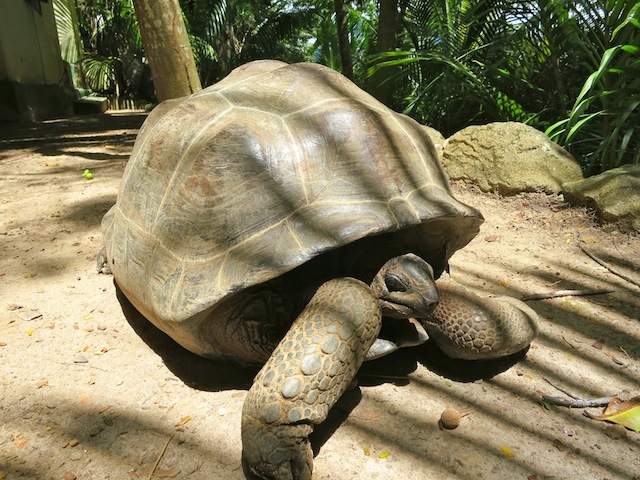 Now this tiny Seychelles island is home to 2000 birds, more than 100 giant tortoises, 700 towering mahogany trees, a huge number of local plants, two dogs and a warden. Plus a couple of mysterious grave sites. I could swear this one started chasing me and let me just say, in a tortoise and a hare race, this monster would have won. He’s probably had a century to practice! If you think it’s fun being chased by a tortoise with possible amorous and/or aggressive intentions you would be wrong. I shrieked and leapt out of the way. Then I discovered that tortoises rule the paths on Moyenne and know it – so don’t get in their way. Tortoises can live up to 180 years. The oldest tortoise on Moyenne Island is said to be in the region of 76 years old. Brendon Grimshaw knew each one and gave them names such as Florita and Four Degrees South (which is the latitude of Moyenne Island in case you were wondering). In retrospect, the big tortoise who was aiming for me, let’s call him Four Degrees South, may only have wanted a pat on the head. They’re actually quite friendly and I saw a little boy playing with one happily. Still, when ol’ Four Degrees South was eyeing me with those hooded tortoise eyes, I felt he was up to something. Hey, stop that! Have you no decency? In fact, two of them were getting extremely friendly right in front of me, and one thing I learned about nature on Moyenne Island is that tortoises can make very scary growling primal beastly noises when they’re being friendly. It was actually quite startling. Once the amorous tortoise shock had worn off, I played with the resident dog who LOVES water. I’ve never seen a dog skip, leap and hurl himself into the ocean before, but at least he didn’t make any primal beasty noises. He was more of a scamperer than a predator so that was very fun. Pirates of the Seychelles islands! 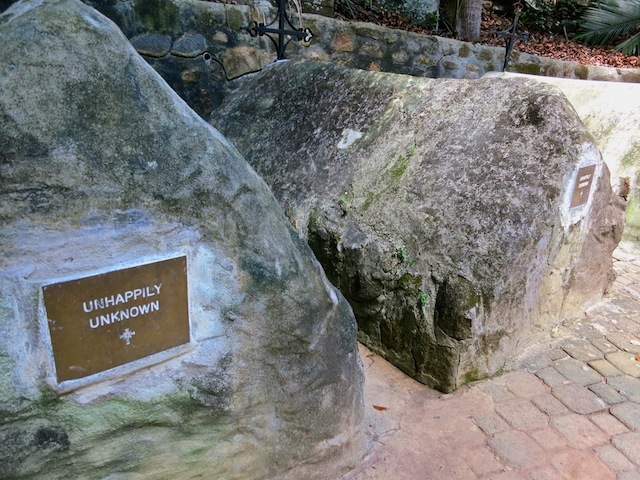 Brendon Grimshaw loved Moyenne Island so much he wanted to be buried there, so he dug his own grave and his tomb can be seen today. Beside it are a couple of other graves (including his father’s). Years ago during Grimshaw’s explorations he discovered some rock graves and they are believed to be the last resting place of two pirates. Speaking of pirates, there is said to be a lot of pirate loot buried around there though Brendon Grimshaw never found any – at least not that he admitted to, and why would he need it if he owned an island worth 34 million euros?. I suppose you could look for it yourself, but you’d have to get past some pretty scary guard tortoises first. And good luck with that. If you thought private islands were only for the Richard Bransons, Mick Jaggers, Russian oligarchs and Saudi Princes of this world, think again. It’s for tortoises. In fact, there may even be a speck of an island out there in the Indian Ocean just for you. Moyenne Island is part of Ste. Anne Marine Park. 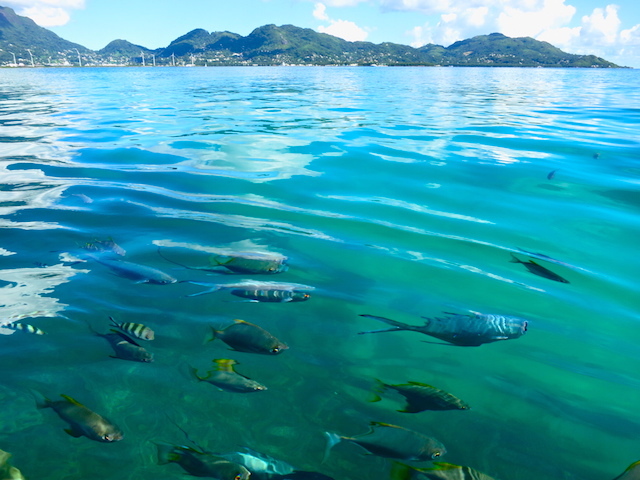 Only 5km from the main island of Mahé, it’s an ideal for a full day snorkelling excursion. Ste Anne Marine Park includes 6 islands: Ste Anne, Ile Moyenne, Ile Ronde, Ile Longue, Ile Cachee and Ile aux Cerfs. 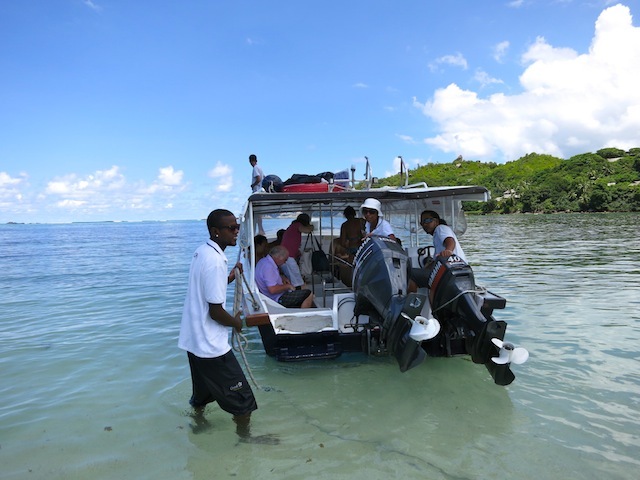 A number of companies offer tours and snorkel adventures. One to try is Creole Travel Services. I so agree, Rosie. 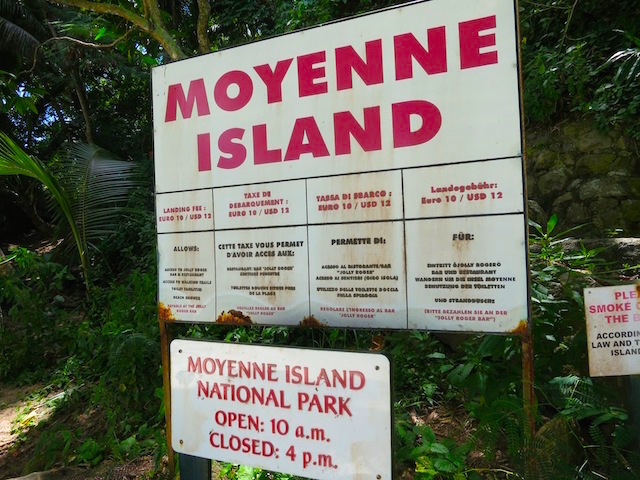 Moyen Island is a fabulous excursion from Mahe. 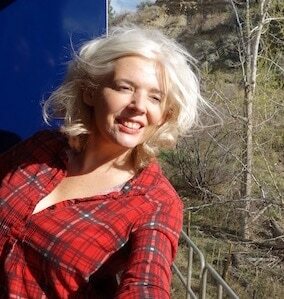 Great article and amazing pics loved the hut. Thanx for sharing your experience. The Seychelles are phenomenally gorgeous. 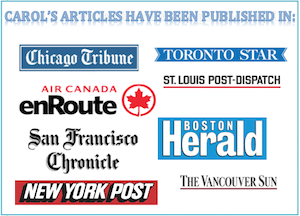 A very special experience – thanks for commenting Noel. Well that totally looks like paradise especially with those frisky tortoises. I’ve always wanted to visit the Seychelles mostly for the snorkeling but looks like the land is also quite interesting! Haha, Jody. 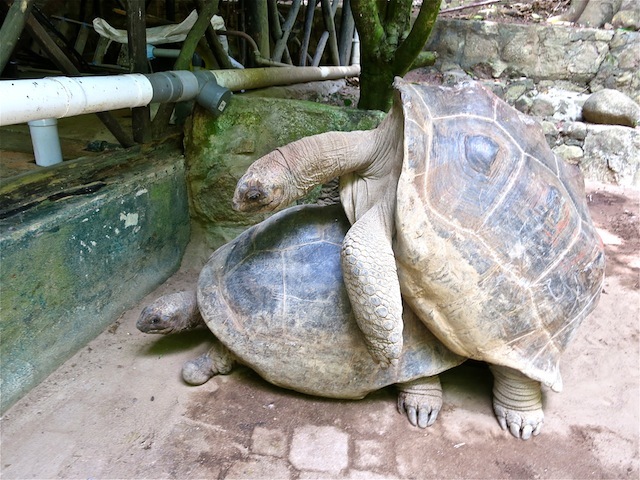 That photo and the amorous tortoises! I can always use a castaway friend, Jen. You’re in. So fun! I want to hang with the tortoises. And if you ever need a cast away friend, I will always be there for you. Curious to see how many times your coco de mer pic gets Pinned:) That island sounds like heaven. I’ve never been to the Seychelles, but it sounds like an amazing places for both tortoises and bipeds. Great photos! From amorous tortoises to mysterious grave sites, for a tiny island Moyenne seems to have a lot going on!